Restore the glory of this forgotten Daedra Lord. Speak to the head of Boethiah at his sunken shrine northwest of Hla Oad, or to M'Aiq the Liar. Travel to Caldera and recruit the Orc Duma gro-Lag as a sculptor. Acquire the Book Boethiah's Glory and 2000 gold for Duma. Travel to the completed statue at Khartag Point after 21 days and receive Goldbrand. One of the Daedra, Boethiah, has a shrine that's more than a bit tricky to find. Why? Because it sank to the ocean floor. Northwest of Hla Oad, on an island, there's a Daedric ruin called Ashurnibibi. If you check out the ocean a short distance west-northwest of the island, you'll find ruined Daedric buildings on the ocean's floor. Among them is the shattered Shrine of Boethiah. 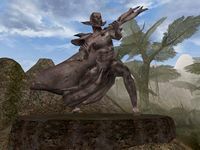 You can activate Boethiah's head, located a short distance from the rest of the statue, and initiate the quest. He wants his shrine rebuilt, and sends you to Caldera to find a sculptor. Ask around and you'll be directed to a shopkeeper named Verick Gemain, who in turn directs you to an Orc in Ghorak Manor across the street from his shop. 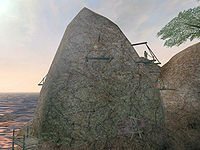 The Orc, Duma gro-Lag, is on the third floor of the manor and requires 2000 gold and a copy of a book on the shrine (Boethiah's Glory, available in Jobasha's Rare Books in Vivec) to begin work. He tells you that it will take him several weeks to complete. After 21 days the shrine will be finished, although you get no journal entry saying it is done. At that time, head to the rebuilt shrine—located at Khartag Point—and activate the statue. Word of caution, though: the statue has to be totally built in order for you to activate it, so venturing two days after the sculptor gets there will be pointless. You will be rewarded with Goldbrand, a one-handed longsword with impressive base damage and good fire damage. M'Aiq the Liar will tell you about this quest if you meet him on his island in the Sheogorad region. After doing this quest, check out the Shashev's Key quest for an opportunity to upgrade your new sword to the statistically superior Eltonbrand. Boethiah's dialogue isn't particularly easy to understand. When starting the quest, s/he says "What do you want with me, mortal? My shrine is in ruins, my priests have forgotten me. Will you rebuild my shrine, mortal? Restore it in all its glory? Accomplish this, and I will reward you. You will be the bearer of Goldbrand, my sword of legend. There is one who can help you do this for me. Listen.... Rough hands to smooth stone, Carving rock instead of bone, In Caldera an artist waits, His masterpiece to create. Find the one who may shape the rock. Go." and after the statue is built, the line is "You have done well. This shrine is a worthy one, and my power will again be felt. Take this, mortal. Wield the Goldbrand with a strong hand, and let all know that my Shrine has risen!" In the vanilla version of the game, speaking to M'aiq before finding the shrine breaks the quest. The script that plays Boethiah's greeting and sets the journal to stage 20 and 30 only runs if the quest stage is less than 10. Patched versions correct this to less than or equal to 10. 10 I spoke to the khajiit [sic] M'aiq, and he gave me information on a sunken shrine to Boethiah off the coast near Hla Oad. It's difficult to know whether or not this is true. This khajiit [sic] seems to have a lot of ridiculous information. 20 I have found the sunken shrine to Boethiah and spoken to the Daedra. He is understandably upset that his shrine has been allowed to remain in ruins, and wishes for a new one to be erected. If I can get the shrine rebuilt, he will reward me with the Goldbrand, a legendary sword. My first step should be to find a sculptor. 40 I have found a sculptor in Caldera. He is an orc [sic] named Duma gro-Lag. 45 I don't think this could be the sculptor I seek. 50 I have asked Duma gro-Lag about rebuilding the shrine to Boethiah. He has agreed that it would be a wonderful project to be a part of, but he will need 2000 septims for materials, and will need some idea of how the shrine should look. Duma suggests I seek out a book that describes the shrine as it once was. In the meantime, he will search the area for an appropriate place to build the shrine. 60 I have returned to Duma gro-Lag with the items he required to recreate the Shrine to Boethiah. He seemed excited to begin, but warned me it would take some weeks to complete. 61 Duma gro-Lag tells me his work is complete, and that the shrine is rebuilt. 70 Finishes quest I have returned to the completed Shrine to Boethiah. The Daedra seemed pleased with the work that has been done, and has rewarded me with Goldbrand, a truly spectacular weapon. This page was last modified on 23 November 2018, at 20:14.